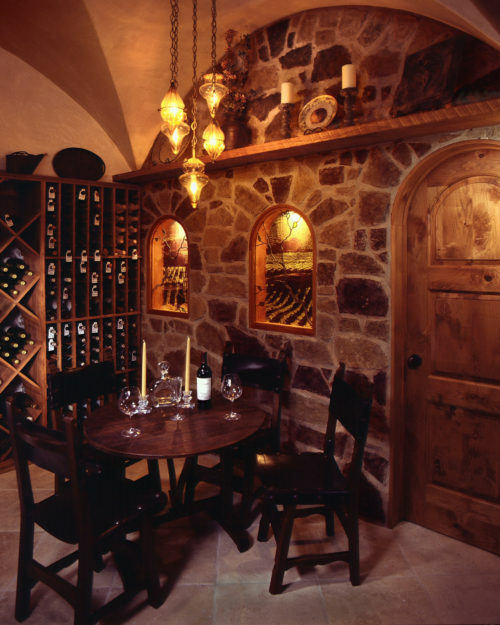 Wine Cellar at 104 Prudencio Lane – This client had very high ceilings in the basement of their existing Aldasoro home. Under those circumstances, they were able to have an Italian Wine Cellar. Gerald Ross was able to design this remodel in a short time frame. The ambiance was created with a barrel vault, bisected with a cross vault. Moreover the area is lit with hand made lighting fixtures from Italy. Significantly stone floors and walls with arched wood doors blend with the ceilings. Additionally posters of grape vine fields behind slightly fused glass were added for effect. Therefore, almost to make one believe the winery is just outside in the Italian country side. Constructed and finished by Norm Grey.